Received a Golden Star scratch card with your last purchase at Missouri Star Quilt Co.? It’s now time to redeem your prize at MSQCGoldenStar.com! Missouri Star Quilt Company’s 3nd Annual Golden Star Games has begun on October 1, 2017. All this month, get your Golden Ticket when you spend $25 in-store or online. You could win a VIP trip to Missouri Star Quilt Co in Hamilton, Missouri. Plus, thousands of prizes including fabric bundles and precuts from your favorite vendors. All you have to do is claim your prize at www.missouriquiltco.com/golden-ticket! First, use a lucky penny and scratch your game card to reveal the prize code. 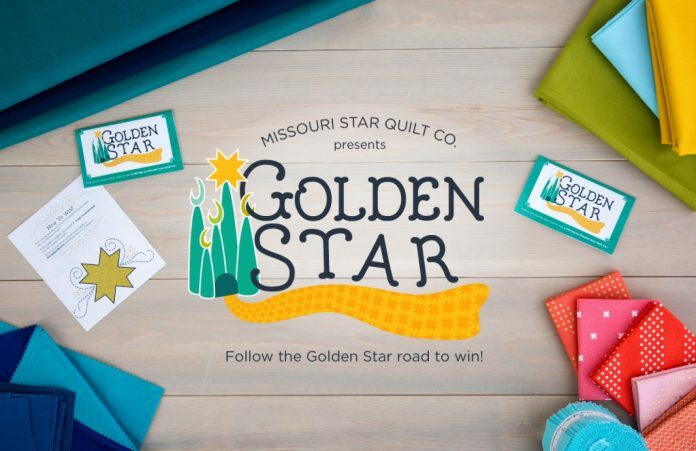 Second, visit the promotional website at www.missouriquiltco.com/golden-ticket. Third, you can either sign in or create an account to get started. Four, enter the 8 alphanumeric code printed on your scratch card then click “Submit”. You have until October 31, 2017 to submit your entry codes at msqc.co/GoldenStar. During the Golden Star Games 2017, up to 100,000 Golden Star Game Prizes are available to be won. You can find a complete list of prizes below. Be sure to share your winning card on Twitter, Facebook or Instagram using #msqcgoldenstar. And let us know if you win! I too want to Complain I have 15 tickets and can not get them lodge in. Submit the code #and nothing happens. I have order from Mo Star for yrs and probable paid for one of their helpers. I know the it is just 15but that is $15.00 that they can keep as your own pay and I noticed that by the messages that you care not. I will probable be using your site less. Nancy notion, Eleanor Burns, Shabby Fabrics and many more choices. I probable will not find my comments on any place on your web site. I too went to the site and put my code in and clicked on submit and nothing happened. I feel cheated. I am going to cancel my order that I was going to place using ($1.00) my “winning” Golden Star ticket. I received a golden ticket today. I was wondering if other people are having difficult time reading the ticket after you scratch off the gold? Anyway, I won a quarter bundle, where does show in my account that I won? Very excited I won something this year. Hooray. I can’t wait to see my prize. I am glad I am not alone in having a terrible time reading what it says on my ticket. Had to have my daughter read it to me. I have an $1. Golden Star card, but when trying to use it, site says that it isn’t any good. I got $1.00 in quilter’s cash, and registered it, but it doesn’t show up when I go to check out. What am I doing wrong? I wish we received a ticket for every 25.00 we spend. Last year I purchased over $350.00 sewing items with my birthday gift cards. I did not want to pay separate shipping knowing I would only win a dollar. So I only received a few tickets, maybe 3. This time around I have only spent 75.00 and received three tickets. Of course, when I had other items under 25.00. I had not even thought about purchasing more to receive a dollar ticket. And when I had other items to purchase to bring my total over $50.00 dollars I did not. I would still only receive one ticket. There are items I have been waiting to purchase; however, the golden tickets has not induced me to buy them from MSQC. I am not excited about this year golden tickets and neither our my friends. Love the promotion for the golden star!! !